I just installed the beta version of Windows 7 on my laptop. Thus far, the experience has been generally good. I like what they've done with the Start Menu and Taskbar (though I did tweak the settings slightly), and the new User folder makes organizing your files a seamless experience. 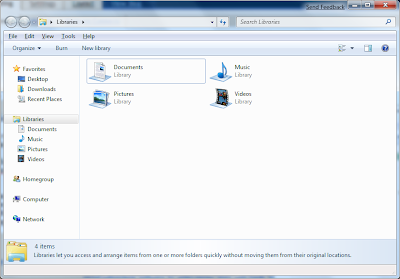 I downloaded and installed the Windows Live programs, and I've given a couple of them a try. These programs also work on Vista and XP, so they're not unique to Win7, except that Microsoft developed these programs along with Windows 7 as an answer to what other companies have to offer. Windows Live Writer appears to be a blog publishing program. I've messed with it a little bit, but this post is being authored using the Blogger website (running on Firefox, no less), so that ought to give you an indication of how much I'm plugged in to the Microsoft universe. Windows Live Messenger is the same old chat program, where you sign in with your Windows Live ID (a.k.a Hotmail/Passport/MSN account). I don't use my Live ID for much, and I don't connect with others using it much either. I do chat over MSN, but my Hotmail account is just one of three IDs on three different services that I use all the time (and the least active of the three), so there is very little chance that I will switch to using Messenger over Pidgin. Windows Live Photo Gallery is basically Microsoft's answer to Picasa. It's a relatively slick interface, and from what I hear it integrates with Facebook (and Facebook has a patent on user-initiated facial tagging, so let's hope that's in there somewhere). Windows Live Mail is an e-mail program, along the lines of Outlook Express, but hopefully not as cumbersome and annoying. I haven't tried it yet, but it looks like it will work with multiple e-mail providers, not just Microsoft-owned ones. Windows Live Call is a VoIP client that works with Messenger (I think). Windows Live Family Safety is a console for parents to monitor and control their kids' online activities (though I'm sure it only works with other Live services). 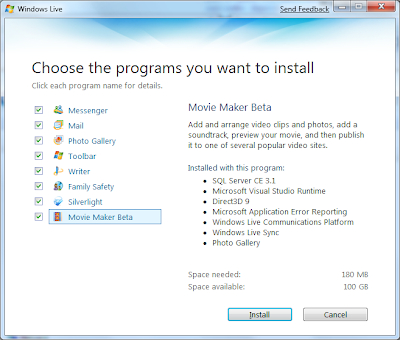 Windows Live Movie Maker Beta is a video editing and publishing tool. I haven't messed much with video editing, so it's nice to have a free program that does that. Some of these programs interest me and some don't. As I already mentioned, I'm not likely to switch to Messenger from Pidgin because Pidgin works with Google Talk and AIM as well as Live. The same can be said of MSIE, which lacks indispensible extensions that Firefox has (though I hear Foxmarks is testing a version of their bookmarks manager to work on MSIE as well as Chrome). Writier is worth a try, as is Photo Gallery, and Movie Maker looks interesting if I ever have a need for it. With the release of Windows 7, Microsoft is pushing for modularization, since anyone can develop their own programs to fill these roles and have them seamlessly integrated into the operating system, and from the Application end. Microsoft is providing their Live applications as a download so that they can escape the criticism they've gotten in the past of forcing their services on the users. Some OEMs will install them by default, some will install competing application suites (such as from Google). In the end, I hope that this will result in innovation and competition that benefits all users. If and when I have a chance to explore any of these in the future, I'll try to put a post up about my experience. I want to give the Microsoft versions of software a fair chance, but I'm not prepared to simply do without the familiar programs that I use all the time. To that end, immediately upon installation, I installed Firefox, Pidgin, Chrome, Picasa, OpenOffice, and PyTTY. I was pleased to find that Windows 7 has PowerShell already installed. PowerShell is a much better command line interface than the old DOS-like cmd. I still haven't used the command line much in Windows (at least not at home), and when I do, I'm usually running Cygwin commands or logged in to a Linux box via SSH.